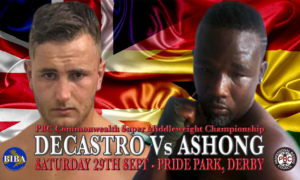 Decastro Fires Warning Shot Across Ashong’s Bow Ahead of Commonwealth Title Clash on 29th September. KO me in 4! Sowah’s Dreaming, After We Fight He’ll Be Having Nightmares, Decastro Retorts. Dunecs Likes To Go Toe-to-Toe, So Do I, So Expect a War on Saturday Says Peers. Two-Time World Champ Harrison Returns On 8th Dec – Faces Ghana’s Annan in Glasgow. Decastro: It’s My Destiny To Be World Champion. White: I’m Overjoyed at Winning my First Title, Now I Want More, Many More!